At the edge of the Atacama Desert, one of the driest places on earth, Lima, Peru, receives almost no rainfall. About 700,000 people have no access to clean water for drinking or bathing. Another 600,000 of the city's 7.5 million residents rely on cisterns for their water, which must be filled by pumps or by hand and cleaned regularly. But Lima's Pacific Coast location experiences humidity of more than 90 percent on summer days, from December to February. So engineers from Peru's University of Engineering and Technology (UTEC) have devised a way to turn that humid air into usable water. Last December, they erected a billboard in the Bujama District of Lima that by early March had produced 9450 liters (about 2500 gallons) of water. The idea came about because UTEC was facing a slump in enrollment as the new semester approached; the engineering department wanted a way to attract more engineering students to the university. They went to Peruvian ad agency Mayo Publicidad, and the partnership of engineers and marketers crafted an advertisement that would provide a very visible demonstration of the university's engineering projects. The water-collecting billboard was born. Electricity from the city's power lines runs the five condensers inside the billboard. Like the condenser in your home air conditioner, the ones in the UTEC billboard are cooler than the air outside. When air contacts the cooled surfaces of the condensers, the air also cools, and the water vapor in the air condenses into liquid water. After reverse-osmosis purification, the water flows down into a 20-liter storage tank at the base of the billboard. The billboard generates about 96 liters of water each day, and a simple faucet gives local residents access to the water. UTEC has not yet announced whether the water will be available for free, but the billboard reportedly cost only about $1200 to install. This is not the first attempt to pull clean water out of thin air. In 2011, French company Eole installed a wind turbine in Abu Dhabi, which the company claims generates more than 1400 liters of water each day. The WMS1000 is 24 meters (about 78 feet) tall, and its 13-meter rotor turns at up to 100 rpm to run a 30-kilowatt generator. This in turn powers a cooling compressor inside the turbine. An intake pulls air into the compressor, and moisture condenses out as the air cools. The water runs down into a purification and storage tank at the base of the turbine. The turbine needs winds of at least 15 mph to generate enough power for the compressor. In a desert climate with an average temperate of 95 degrees Fahrenheit and average relative humidity of about 30 percent, the WMS1000 generates about 350 liters of water a day. In humid coastal climates, production increases to about 1200 liters a day. Adding a solar power unit to the turbine could increase output by a few hundred liters more. Eole designed the turbine for remote communities of fewer than 5000 people, but when it launched the WMS1000 commercially, in 2012, the price tag for a single turbine was about $660,000, well beyond the budget of most small communities in developing countries. Back in Lima, the UTEC engineering department and Mayo Publicidad may have found a way to offset the cost barrier: advertising. Since the billboard's installation, UTEC reports a 28 percent increase in enrollment. Results like that may attract the attention of private companies looking for new ways to advertise. The city of Lima and other urban areas, such as Cairo, Egypt, suffer the same lack of potable water as remote villages, and an advertising-funded solution that taps into an existing electrical infrastructure may work well there. 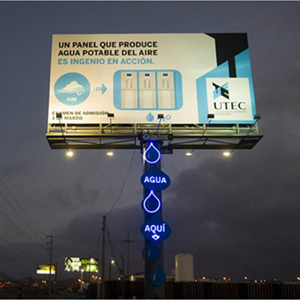 UTEC has not yet announced plans to install more billboards in Lima or to make the technology commercially available elsewhere, but the project has started new discussions about how to provide access to clean water. Worldwide, the World Health Organization estimates, about a billion people lack access to safe drinking water. Lack of clean water is a leading cause of cholera and other diseases that cause diarrhea. Perhaps UTEC's idea can make the situation a little better, one sign at a time. How to make a simple solar water still to make your own fresh water from soda PET bottles quickly and at almost no cost. The design is not perfect, I am still working on it, but the advantage of this design is the bottle water still can be hung up off the ground to keep away from animals or being blown over in the wind and the collection bottle allows you to not have to tend to it for days as it slowly fills up with fresh distilled water. The cost is almost nothing as it is basically recycled water or soda bottles, string,cardboard, hot glue and tape. Some people are going to freak over using plastic soda bottles. Glass bottles can be used instead if you are competent in cutting them in half. Dan Rojas at green power science has the best method on youtube on how to cut glass bottles if you are interested. However,the plastic soda and drinking water bottles should not emit harmful chemicals at low temperatures and the pvc collection tube can be replaced with hollow bamboo or elderberry or other local material. The cardboard wick component can also be replaced with untreated cotton or other wicking material. Wooden shims or spacers can be used in the interior instead of hot glue to keep the interior container centered. How much water can you get from one bottle? The second day I used the still I got 46 ml in 8 hours on a mild partly cloudy day. If you don't have access to 3 liter bottles you can use more common 2 liter bottles and add the cardboard wick to your interior container like I did with the 3 liter bottle. The collecting bottle should be covered to protect the water from being evaporated again. The design can be assembled very quickly after you make the first one. I know 46 mls is not a lot of water, but if you need clean water and have more time than money and access to recyclable bottles why not make a lot of bottle stills? This design would allow you to make a lot of water in unused space along walls and fences or even the south side of trees as the design is vertical. It is also mobile and can be taken with you. It would be ideal for a boat too . If you have negative comments about my design and have improvements, please let me know. If you only have negative comments and no helpful input that will make the design better please save your time. I have been without water before. To me, clean water is civilization. without clean water life is terrible. Millions of people all over the world suffer from unclean water. I am hoping in some small way this design will help somebody, or at least be a start. Thanks for watching and check out my playlist on over 100 videos on things to make with recycled bottles. If you know someone this video might help or a forum that might be interested, please send them the link. Also, if you are interested in prepping and survival topics, check out survivalblog.com which is one of my favorite prepping sites on the web. I add new videos every week and have over 300 on all sorts of subjects..
Don't forget to check out the other unique youtubers I feature on my channel and subscribe to my channel if you haven't already. Pure drinking water from seawater using only solar energy. See how it is done using only the sun! This man invented this clay structure that can distill and produce clean and pure drinking water from sea water. It may even produce distilled water from polluted water. The process of distillation is to evaporate any water source into steam or water vapor, and cool it down so only pure water is condensed and collected. But doing so passively is the difficult trick. This man has done so - and for the good of all the people in the world who will benefit from this invention! Access to clean drinking water is a huge problem in the world, and leads to millions of deaths a year. Scientists have tried to work on the problem, finding ways to make water otherwise unsafe to drink potable. There's a the membrane technique-- but it's very expensive and not a viable option in water-stressed areas. There's a new idea from the University of Texas at Austin in the form of a small chip that neutralizes chloride ions at the microscale, desalinating the water. It's promising...but is the tech there yet? Kim Horcher and science educator Cara Santa Maria discuss the new development. Demonstrating how you can use a food saver type vacuum bag to purify 11.5 gallons of water using the SODIS water purification method. Bag should be filled with clear water and placed in direct sunlight for 6-8 hours. This method uses UV "ultra violet" light to kill bacteria and viruses in the water. This method will do noting for chemical contamination.